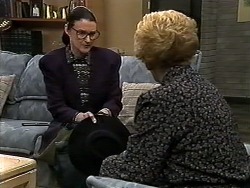 Madge is in a fury about Dorothy blabbing to Felicity about the parking ticket. 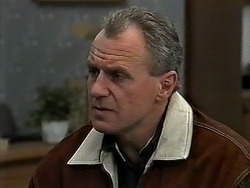 HAROLD: I'm sure it was just a slip of the tongue! MADGE: It was not a slip, it was an avalanche! 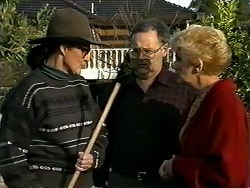 Harold tries to calm her down, but Madge is convinced that Dorothy has it in for her. She's worried what Felicity will say at the council meeting. MADGE: I tell you Harold, I'm not going to be able to sleep a wink, thinking of ways to murder Dorothy Burke! 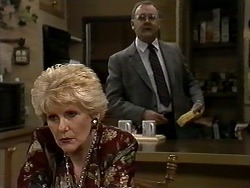 Harold says that Madge is over-reacting - after all, Madge DID use her influence to quash Helen's parking fine! Madge isn't pleased to hear this because she knows Harold is right. Beverly is clearly trying to ingratiate herself by making everyone a slap-up breakfast. Jim has calmed down a bit and apologises for shouting the night before. Jim looks rather hungover and tells Beverly that they have a lot of talking to do, but Beverly wants to wait until after breakfast. 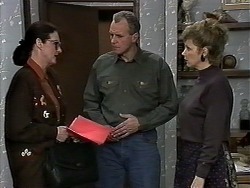 Dorothy comes round to tell Jim and Beverly about their suspicions over Todd's homework - Josh, Cody, Melissa and Todd have clearly been colluding. They can't ask Todd about though, because he's gone over to Cody's. Jim and Beverly say they'll support Dorothy in any punishment for Todd. Joe and Toby have been out re-homing the kittens and have finally got rid of them all. He strokes the cat they are keeping, Tiger. JOE: Where's Amber? Out talking to the lawn? Kerry explains that Amber has gone to an animal rights meets - it seems poachers have been shooting ducks in the National Park out of season. KERRY: If they organise a protest, I'm going to be part of it. KERRY: Do you mean that? JOE: Yeah, look, just cos I'm not a card-carrying greenie, doesn't mean that I like seeing innocent birds shot out of the sky. KERRY: Can you remind me to tell you every now and again how terrific you are? JOE: I reckon that can be arranged! Just then, Melissa comes round to see Kerry. 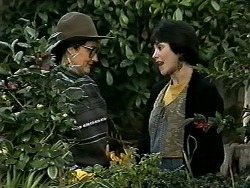 She's comes to tell Kerry that Dorothy has hired an exterminator to get rid of the mice in the school. Kerry is shocked. Dorothy has just got done telling off Josh, Cody and Todd about their homework. Josh tries to say that it was an experiment in computer technology. CODY: We'd never have done it if we'd known we'd be sprung. DOROTHY: What sort of excuse is that? Doug thinks it was just a prank and Dorothy is not impressed, telling Doug that he's condoning cheating. Dorothy is going to ban all students from using computers to do their homework. Beverly has come round to see Kerry. Kerry asks if she's sorted things out with Jim. Beverly says she hasn't - she keeps putting it off. BEVERLY: When I tell him where I've been, he's not going to be too happy about it. And I've made some tough decisions. He won't be happy about those, either. At least, I don't think he will. KERRY: Have these decisions got anything to do with Ewan? BEVERLY: Yes. That's where I've been. I went to Perth to see Ewan. Kerry has come to talk to Dorothy about the mice. Dorothy says they are a health hazard. Kerry says the mice aren't at the school - so there's no need to get an exterminator. Kerry says the whole thing has got out of hand and she just wanted to set things straight. Dorothy tells Kerry that she's going to drop the charges against her. DOROTHY: Just as a matter of interest, what did you do with the mice? KERRY: Well, some of them went to good homes and...as for the rest of them, well...I don't think they'll be a bother to anyone. Joe and Toby are cleaning when Joe thinks he saw a mouse. 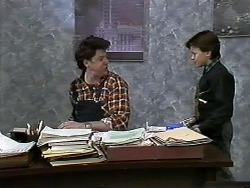 Toby sees it too, but tells Joe he was seeing things. Jim is ranting at the four about their cheating over the essays and takes Todd home. Josh is upset about not being able to use the computer - now he'll have to do something about his handwriting. He wonders if there's another solution. Melissa is helping Josh with his essay by copying it out neatly for him. Madge and Harold give Kerry a present for the baby. Kerry opens it and it's a cute dog soft toy. Kerry asks Madge about the council meeting - she's been very quiet. Madge says she's made up her mind to resign from the council. Harold thinks it is the honourable thing to do, but Kerry thinks Madge should stay - she one of the few decent politicians on the council! But Madge is worried about ruining Harold's reputation as well as hers - she's definitely resigning. Dorothy wants a word with Josh because it's in Melissa's handwriting. Josh explains that his handwriting is very bad and asked Melissa to copy it out for him. She doesn't believe him though, and tells him his punishment will be that he's off the school soccer team. Josh is aghast - the finals are looming. Beverly is on the phone discussing the sale of the medical practice. Jim comes in halfway through the conversation and overhears. When Beverly is finished, they decide to talk about their situation. 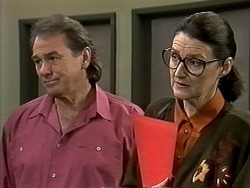 Beverly tells Jim that she did go to Perth when she was away - to see Ewan. He's offered her a job in perth. Madge is drafting her letter of resignation when Dorothy calls round. She tells Madge she has some interesting information about Felicity - it seems Felicity has used her influence on council to have some areas of Erinsborough re-zoned. Apparently this meant that her husband could open retail outlets there. MADGE:(excited) Oh, Dorothy, that's wonderful! (coughs) I mean...er...what an outrage. DOROTHY: Yes, I thought you might feel that way. Also, her husband won the contract to provide work clothes to council employees against very stiff competition. Madge is also appalled(!) about this. She says she's decided not to resign after all - she's going to go into the meeting and stamp out corruption in Erinsborough once and for all! 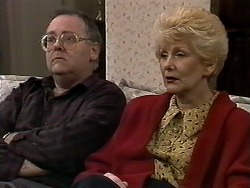 BEVERLY: I really wish it weren't true, but I've come to realise that the baby was the only thing holding us together. We've got to face it. Our marriage is over. It's been over for months. JIM: Are you sure of that? BEVERLY: Aren't you? Be honest, Jim. Don't you feel the same way? JIM:(pause) yes. I suppose I've just been kidding myself. The thing is, I've always felt that marriage is for keeps, and I can't help feeling disappointed that we've...failed. BEVERLY: Neither can I. But it's not a very good reason for us to stay together. JIM: No. No, you're right. So...have you decided what you're going to do? BEVERLY: Pretty well. Neil's probably going to buy me out of the Practice, and I'm fairly sure I'll take the job that Ewan offered. I'm fairly sure I'll be able to combine administrative work with research. Sounds ideal. JIM: Well, research was always your main interest. BEVERLY: Yes. I think it'll be a very good move for me. For both of us, I hope. JIM: So, what about Todd? Todd and Cody come in at that moment. JIM:(awkwardly) Todd. Bev and I have decided to separate. Bev's going to go and live in Perth. TODD: That's great isn't it(!) So what happens to me? BEVERLY: I've already spoken to your mother about it. And she's agreed there is only one possible solution. You'll have to go back to Adelaide and live with her.